Tonight on AMC THE WALKING DEAD continues with all its gory goodness. Tonight’s episode is called, “Infected” and on tonight’s show Rick and the others must fight to protect their home. If you happened to miss the last episode, don’t worry. We’ve got you covered. Click here for a full recap of the last episode to find out what you missed! On last week’s show the group was still in the prison and they managed to create a fairly decent home. Maggie and Glen were still a couple and Maggie was ready to play house and he was hesitant. Rick decided to be a better father this season. As we have suspected Rick and Michonne were growing a little closer. The big shock on last episode was someone turned into a Walker with out being bitten. On tonight’s show as the group faces a brand new enemy, Rick and the others must fight to protect the livelihood they worked so hard to create at the prison. Tonight’s The Walking Dead Season 4 episode 2 is going to be exciting, and you won’t want to miss it. So be sure to tune in for our live coverage of the new episode of The Walking Dead — tonight at 9PM EST! While you wait for our recap, hit the comments and let us know how know how excited your are for the new season of TWD and what are you hoping will happen this season. Check out a sneak peek of The Walking Dead “Infected” below! Don’t forget to come back at 9PM. RECAP: We see someone at the front of the fence with a rat; they are feeding the walkers out side which is what probably lures them to horde to the prison. Tyreese is talking about how losing Zach still bothers him; he remembers when life was much more simple but you could now lose anyone easily. Tyreese starts singing a song to the girl he’s with; Tyreese walks her to a part of the prison and says goodnight. His girlfriend is now in the shower room and washes her face; she hears something and goes looking around with the flashlight. She pulls these curtains apart and sees nothing. Zombie Patrick now gets up as she leaves; she head over to D block and plans to go to bed. She gets to her cell and Patrick starts walking into D block; Patrick passes her cell and goes into the one net door biting a man in his sleep. Rick stops his alarm clock and wakes up Carl; Patrick is sitting in a room eating one of the people. Patrick gets up and leaves and has another zombie with him now; the other one gets up and starts lurking around. Glenn is up and watches Maggie sleeping; he takes out a camera and decides to take a picture of her; the picture wakes her up and he says sorry. Maggie asks if it’s time to change guard shifts and Glenn offers to get her breakfast. Michonne is on her way out and asks what she should get for them while she’s out; Rick and Carl are working in the farm with the zombies looking at them. Carl mentions if they could help other people today but Rick mentions he’s too busy with the farm; Carl offers to go help but says they have other plans. Carl then asks when he could have his gun back; Rick tells Carl that worms will gives protein and they then hear gun shots. Little girls run out of the D block and people say there are walkers inside; Carl lets Michonne back in and some walkers come in with her; Michonee pushes them back and Carl grabs a rifle then shoots on in the head. 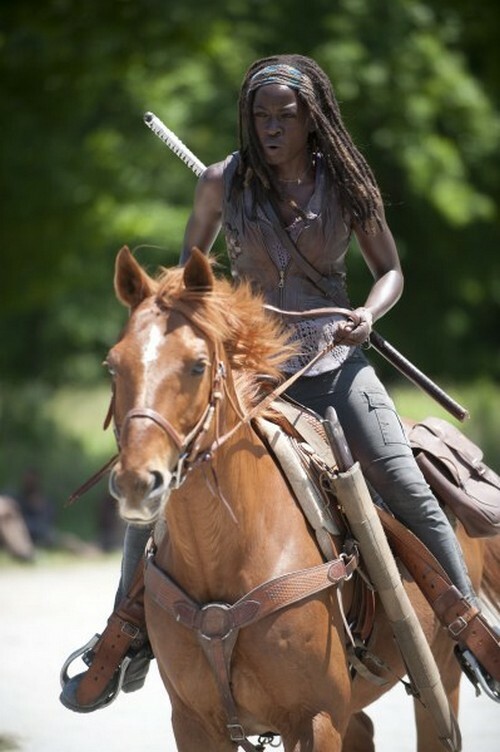 Maggie comes down and helps her but Michonne is hurt. The zombies all start hording on one side of the fence; Daryl and Rick run in trying to save all those they can. Daryl runs in and saves a kid with his crossbow and Glenn starts slicing some of them up. Tyreese walks in and gets his girl but one of the guys is bitten and Carol is ready to amputate his arm; she notices a bite on his neck as well. a zombie jumps Glenn and Daryl saves him with a cross bow bolt to the head; Daryl shot Patrick. Daryl goes in to check one of the zombies by shooting them in the head; making sure they are surely dead. Rick looks into the rooms as well; he takes out a knife and walks in. Rick then comes out and people start to mourn over their losses; Carol is trying to help the guy but he says he knows he wont make it and begs her to look after the kids; Carol then tells him it’s goodbye. Rick sees a zombie and then stabs it in the head; Hershel comes in and Rick mentions how their is no bite on the guy. Bob mentions that it could have been a sickness that killed one of them and had them die fast; Rick says he saw a pig and boar sick that died. Hershel mentions they are all exposed to this illness; the two daughters of the man infected come in and say goodbye to their dad because there is no saving him. He tells the two girls to take care of themselves and then dies right there; Carol takes the girls out of the room and says she has to do what she has to. The daughters offer to do it but one of them says no; the older daughter offers to do it then and Carol tells her to do it just like she showed them. The girl chickens out and starts having a panic attack; Carol takes the knife and then stabs their father in the head. The girls are crying and Carol goes to hug them. Carl runs over to Rick and tells him to go away; Carl says he used one of the guns to help Michonne. Rick tells them that Patrick got sick and died; leading to him attacking the cell block. Rick says that it’s all okay and that they should stay away from anyone exposed to the block; Carol mentions Patrick was fine yesterday but died in the night. Hershel says the sickness is lethal and they have no idea how it spreads; they decide to use a different cell block for those who were in the block. Tyreese’s girlfriend starts coughing and Hershel says that she can’t go back with him; they mention that Patrick probably died by a flu and that Karen his girlfriend is probably exposed. Hershel says they should be separated and they will try to find some medications; Sasha takes Tyreese and Karen away. Daryl goes out to bury the dead, Carol is worried about the other kids being around Patrick. Carol goes up to the girls and mentions how they buried their dad but they will have to talk about what happened. She says that she will protect them like on of her own like their dad asked of her; she tells the oldest Lizzie that she is weak and needs to think of it as life and death. To live she has to become strong, the youngest even calls her stupid and says she’s messed up not weak. Daryl is out in the yard burying the corpse and Rick comes over saying he was useless without his gun; Daryl says he wasn’t and that he would have never made it this far without him. Rick says that he screwed up so much and almost lost his son; he doesn’t believe he can make the calls anymore. Maggie screams for Daryl and Rick; the walkers are putting tons of pressure on one side of the fence; they run over and start to stab some of them in the face. Rick then starts hesitating a bit but then goes crazy on stabbing them. Beth mends Michonne’s wounds, she says she is glad that Michonne came back safe. Michonne says that it’s stupid and that she should have been left out there; Beth tells her that they care for her and that they believe it was worth the risk. Beth asks what you call someone who lost a child, Michonne questions the crying of the baby and Beth says she sense peoples moods. Rick, Glenn, Maggie and Daryl are stabbing them because of the fence falling over. Sasha finds rats on the ground and realizes someone is feeding them; the fence stats to give away. They run away from the fence and have no idea how to stop the walkers coming in, Rick then tells Daryl to get the truck and that he knows what to do. Carl is inside making something to bury the dead; he builds something to be placed on Patrick’s grave. Carol tells her about what she’s doing with the kids and wants to teach them to survive; Carl says it’s between her and the kids. Carol then says it’s between him and her; she doesn’t want Carl telling Rick. Carl says he won’t lie to his dad but Carol tells him she doesn’t want her saying anything. Michonne is in he r room doing some sort of exercise as Beth is singing to the baby. The baby throws up on Beth and she hands the baby to Michonne who doesn’t look pleased; she then starts to cry as she hugs the baby. Beth sees this and kind of just goes away for a while longer. Daryl and Rick go out in the ruck; the walkers see Rick and start going after him. Rick then reaches into his box and pulls out a pig; he cuts the pig and then releases him to the zombies. they start eating the pig and chasing the truck.Rick looks really unhappy about what he’s doing; but keeps going with his plan of luring the walkers with pigs. Rick has now cut three pigs and left them for dead; he looks incredibly upset about it. There are very few walkers at the fence and Carol tells Lizzie that she should not feel bad about them dying; Lizzie agrees and Carol then goes and puts a flower in her hair; the girl takes the knife and keeps it for herself. Rick then scraps his pig pen; he tells Carl to not help him. He believes they should stay away from people for a while; Carl then mentions what Carol is doing with the kids. Carl then says they should let her do it; Rick pours gasoline all over his pig pen and thanks Carl for telling him. Rick then says he wont stop her or say anything; he lights a match and sets fire to the pen. Rick then gives Carl back his gun and then takes back his own.Rick then takes off his blood stained shirt and throws it into the fire. Tyreese goes to see his girlfriend but notices blood all over the floor leading from her room; Tyreese turns on a light and notices it trail to some room. Tyreese opens the door outside and finds her corpse burnt on the roof.